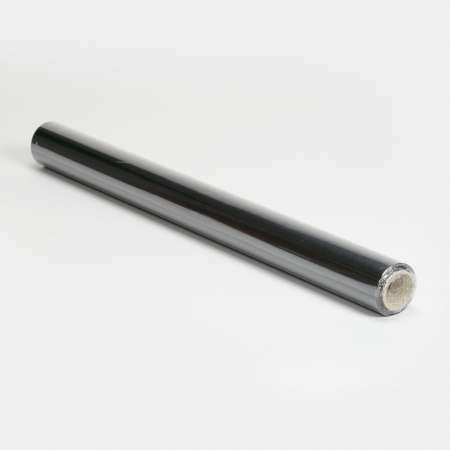 Folio Contact Blackboard is an electrostatically-adherent film. It is ideal for labeling with wipeable window markers. Even writing with school chalk, fluorescent pens and liquid chalk is possible on this product. This film adheres electrostatically to nearly all surfaces without the need for additional glue or other aids. Therefore, no residues are left after the removal of the film. Fields of application would be, for example, use as a pinboard or to darken rooms (see Folio Contact Blackout). The film is also very suitable as a blackboard menu substitute in bars, restaurants or canteens. 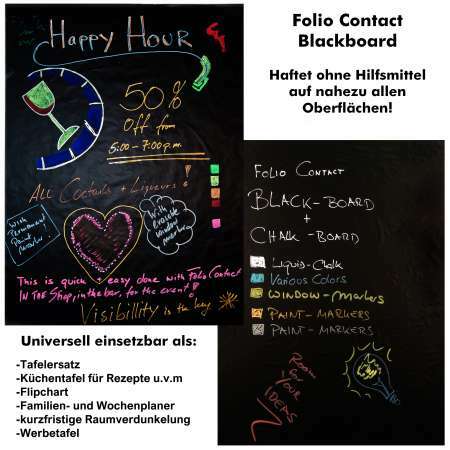 Folio Contact Blackboard is an environmental friendly Flip-Chart Media, made of Polypropylen. It has been developed and been produced by NOPAR International GmbH and patented under: EP 1326918 B1. 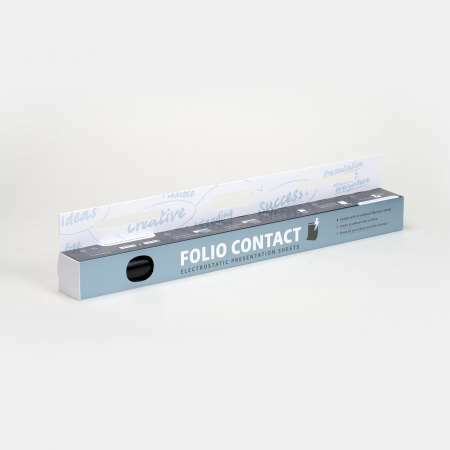 FolioContact is a special produced 3-layer coex cast PP-Film. The mid Layer is able to take on ionisation and keepit for at least 5 Years, depending on the storage conditions, packed and boxed at 40-50% rel. humidity, at 18°C-22°C. The 25 sheets in the size of 600mm width and 800mm length can easily be separated from the roll at the provided perforation line. Each sheet adhere to virtually any surface without any other tools, such as adhesive or pins disputes. The film is ideally suited for use with non-permanent Window Markers, or Chalk. When using permanent markers, it will be not possible to clean the film surface again, exept when alcohiolic cleaning solution is taken (please care about dangerous Goods Regulations). For further details please contact NO PAR International Inc.
moreover you can darken your windows for a short period. It‘s very important that the window is completely covered with the sheets, otherwise the glass could be cracking, because of high temperatures (thermal stress). Folio Contact Blackboard is not made for printing or individual printed artworks in this case we recommend the product Folio Contact gridded. Folio Contact can be recycled, can be disposed with the yellow bag and capable for energy recovery. Safety data sheets can be requested if necessary.